On Steve Cerra’s Jazz Profiles blog, today’s subject is Paul Desmond’s Complete RCA Victor Recordings featuring Jim Hall, a fine companion to your morning coffee. Steve put together one of his celebrated videos incorporating photographs and music, in this case Desmond’s recording of “I’ve Got You Under My Skin” with strings, and pictures by Chuck Stewart, Ray Avery, William Claxton and Ted Williams. The written matter consists of essays by Paul and me. To visit Jazz Profiles click here. Enjoy Steve’s work, then come back to Rifftides and browse the archive’s nine years of posts. You can do that by entering a term in the “Search The Site” box at the upper right or by picking a month and year under “Archives” in the right column. 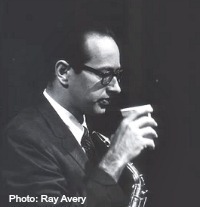 I never met Paul Desmond, yet I have listened to him all my life, and I miss him like I would miss a friend. —- His sound and conception are forever.